The Canoe – pliant and beautifully organic – binds the sea to the land.One of the so-called albatross -tail outrigger canoes extant on Yap Island, in the western group. Mainly used for local fishing. Ends extend above gunwale level in a recurved, 2-pronged fork. Dugout hull. Simple outrigger unit: 2 closely spaced, squared booms cross atop the hull, ending in a lashed stringer; vertical stick connective from each boom inserts directly into the short float; connectives braced back to the booms. Powered only by plaited leaf sails and human sinew, guided by the winds of trade and the timeless maps of the firmament and ocean depths, it is perhaps the single most important symbol of the Pacific and it’s islands. In Yap, the image of the central role of the majestic and ancient craft held in keeping the Yapese empire intact. 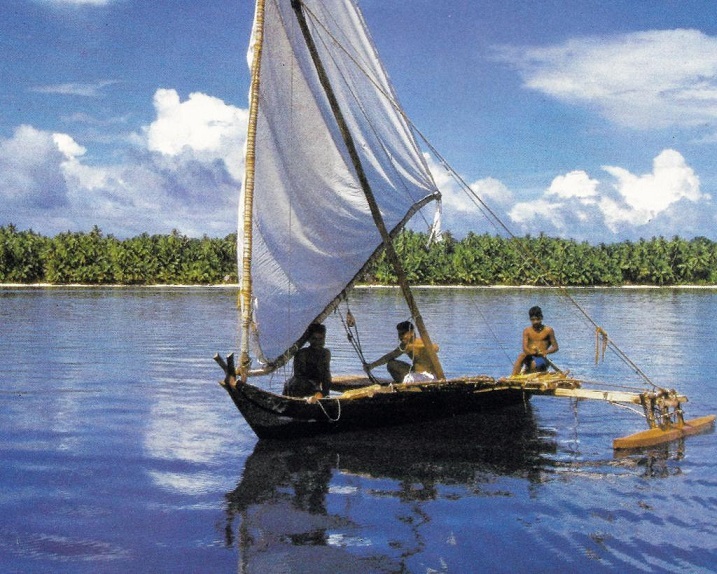 Six different styles of canoes were used in the Yapese empire for specialized tasks like cargo transportation or intra-island travel. The most commonly known style of Yapese canoe is the distinctive two-pronged bow “Popow”, a sleek, seagoing vessel used for the lang voyages to Palau and other distant lands. Building a canoe was a highly complicated task, shrouded in magic and ritual. It required the cooperation of many men and women and the skills of a master craftsman. First, a large mahogany or breadfruit tree was chosen. Carefully, the builders dug the tree from the earth rather than cutting it. This prevented fissures and ensured the strength of the wood in the unforgiving high sea waves. Then the men gathered in large groups to move the wood closer to shore. Strengthened and prodded an by ancient hauling chants they pulled the massive timber to the preparation site. Women gathered pandanus and began the Fine weaving needed for the canoe’s sails, while men labored tediously with stone, shell or metal adzes to hollow the canoe hull. Breadfruit tree sap and coconut husks and fiber rope were used to glue and tie the upper and lower portions of the hull, and to attach the single outrigger, which was made with bamboo, breadfruit tree and coconut fiber rope. Finally, the finished craft was painted and put to sea amidst dancing and ceremonies, and its pandanus sail was unfurled into the wind, held aloft by a towering reversible bamboo mast. Traditional navigators crossed the treacherous waves in search of adventure with-out the aid of modern navigational tools or even a simple compass. The art of canoe construction and traditional navigation are still practiced in Yap State today, although many of the magic rituals and initiation rites have been forgot-ten or abandoned. There may well be no master navigators left on Yap proper. Most of the craftsmen are aging too, and unless steps are taken soon, this art form may be lost to the Yapese people. Source: http://www.yap-villageviewhotel.com/about-yap/canoes. A Dictionary of the world’s Watercraft from Aak to Zumbra.